The last day of Eurobasket Women qualifying round action in Bydgoszcz had at play-off feeling with three teams fighting for the last two places. In addition the match for first place was also important because the winner would face Croatia in the quarter-final while the loser would be drawn against France. In Group F, played in Katowice, Montenegro secured the group win by beating Latvia (70-74). France finished in third place while Croatia sent Spain packing in the loser-go-home match. Eva Vitecková (right) from the Czech Republic did not have a perfect shooting day. But her 26 points, 2 assists and 7 rebounds helped her side defeat Lithuania (63-59) and secure first place. The match itself was close with both teams having their moments. Lithuania went on a 6-0 run to close the opening quarter with a (22-14) advantage. The Czech Republic rallied back in the second quarter with an 8-0 run to reduce their deficit to a single point (35-36). With the first points of the second half, the Czech Republic went ahead. However the lead was to change three times in an exciting quarter with clutch shooting from both sides. The Czech Republic went into the final quarter leading (49-44) but the game went right down to the wire where missed free-throws proved to be costly for Lithuania. For the Czech Republic Katerina Elhotova chipped in 15 points. Ausra Bimbaite also had 15 points. Early in the day Great Britain gave Russia a scare as they rushed out to a (20-8) early lead. The Russians struggled all through the game with the physical style of Great Britain and trailed (45-55) with five minutes left to play. Great Britain once again hit the destruct button and allowed Russia back into the the game. The Russian's clinical finishing was illustrated by Elena Danilochkina's (16 points) corner three-pointer which put Russia in the lead for good with 48 seconds to play. Unfortunately the game ended on a bad note when Russian captain Illona Korstin (in picture with ball) was ejected with 1.4 seconds left to play after a reaction to Nathalie Stafford. Korstin apologised publicly for the incident. Great Britain were eliminated from EuroBasket Women 2011 prior to the game and Tom Maher said that he was proud what had been achieved so far and he was still looking forward with the objectives for the future. 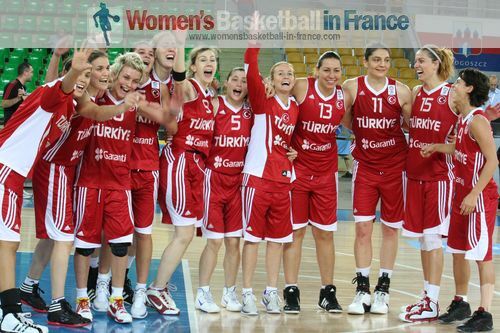 The last EuroBasket Women match in the qualifying round saw Turkey beat and also eliminate Belarus (65-56) from the competition. Saziye Ivegin led the Turkish attack with 17 points while Nevriye Yilmaz finished with a double-double of 13 points and 11 rebounds. Birsel Vardarli also scored 13 points and dished out 7 assists. Yasemin Horasan came off the bench late in the second quarter and then scored the last 4 points of the quarter to send Turkey into the locker room leading (34-30). Turkey then started the third quarter with the first 5 points and never looked back as they stayed in front all the way to the finish. Natallia Marchanka led the scoring for Belarus with 12 points while Nataliya Trafimava added 11 points.